This is a great tract for new age/hippie/student types. 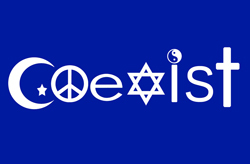 Try distributing them in the 'hip' areas around your town including college campuses.Just say 'coexist' in a friendly and upbeat manner as you hand them off and the person will usually take one. Later, if they get a chance to read it, the truth will hit them right between the eyes. I also do a little street preaching and first of all I want to thank Kerrigan Skelly for inspiring me to get started. The good thing about pinpoint tracks is the message on the back is simple, irrefutable, strait to the point and a mini sermon in itself. 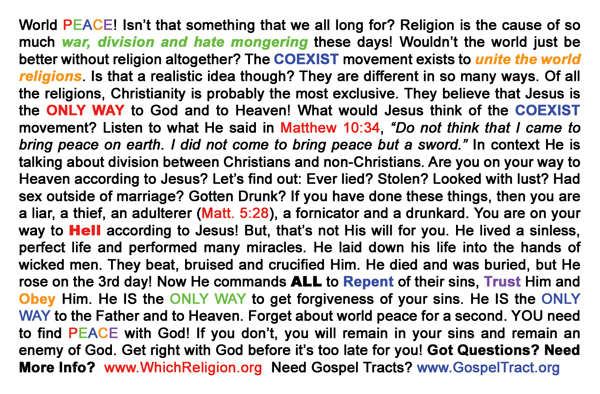 If you ever get stuck as to what the say, the message on the back of these tracts is a great starting point. This tract is great because you have to read 5 sentences into it before there's anything about the Gospel. Many people will turn a tract over and when they read the first sentence and it says anything about the Gospel, they give it back or throw it down. But not with this one. This tract draws in the lost in New Age! Also the teens-30s! Praise the LORD! This tract is Amazing !!!! Great message and design on a well made tract?